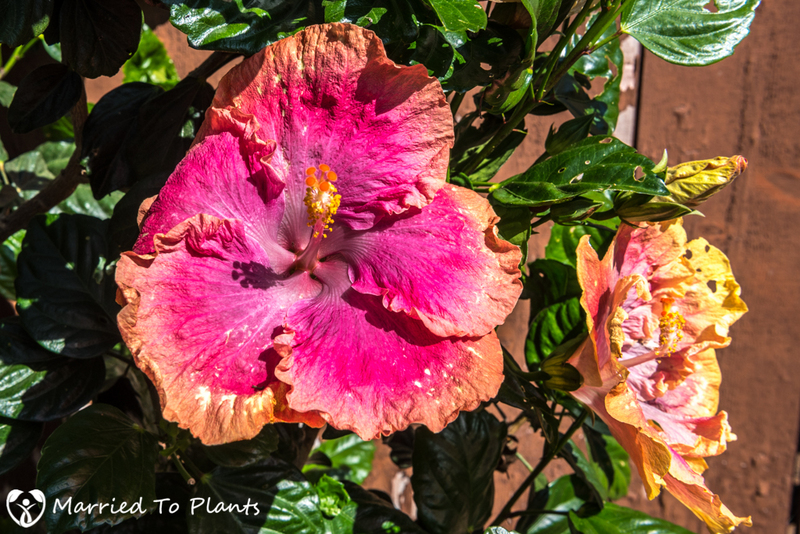 The Southern California Hibiscus Society tours my garden. 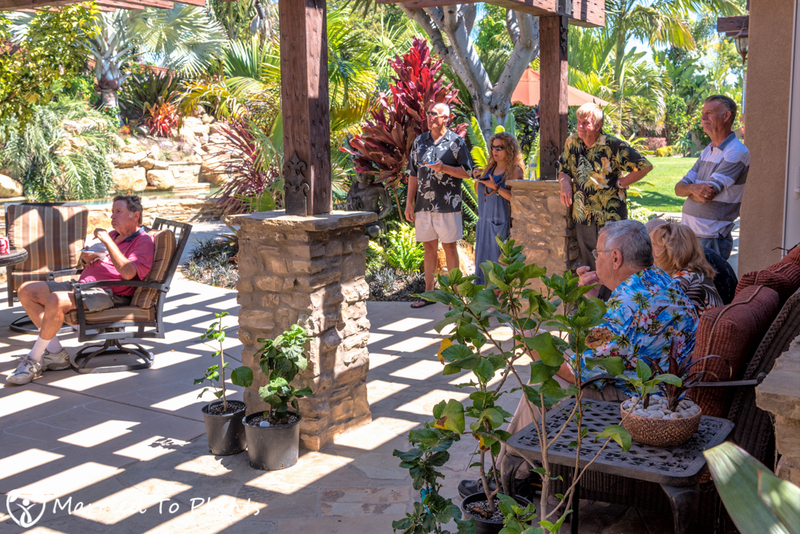 This past weekend I had the pleasure of hosting the Southern California Hibiscus Society (SCHS) for their monthly meeting and garden tour. I usually don’t open my garden up for larger groups, so this was a first. I have meet many of the SCHS members though Facebook and knew that most were from the Los Angeles area. 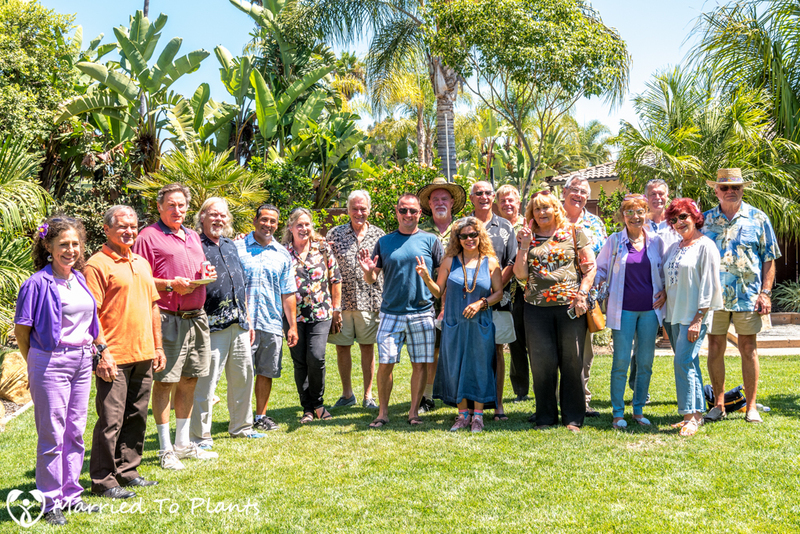 So it was a big surprise many from this group would be willing to drive 2-3 hours to tour my garden and talk hibiscus with other enthusiasts. 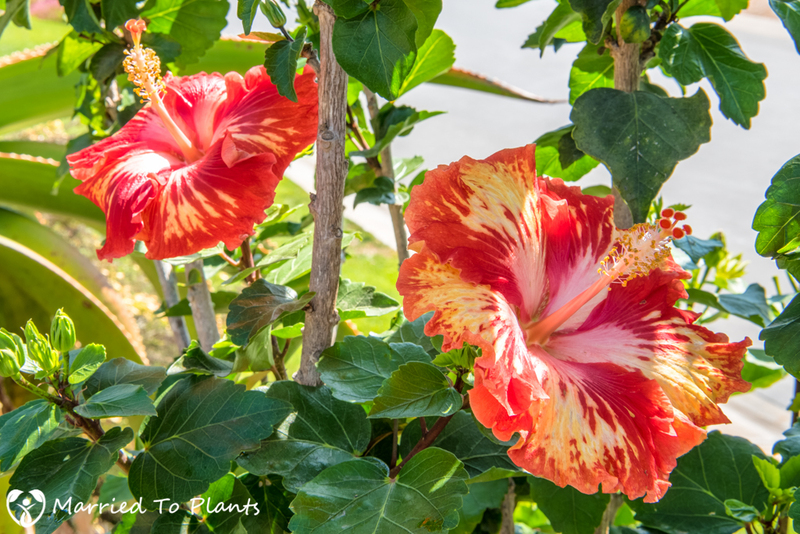 The tour even welcomed a few hibiscus world royalty. 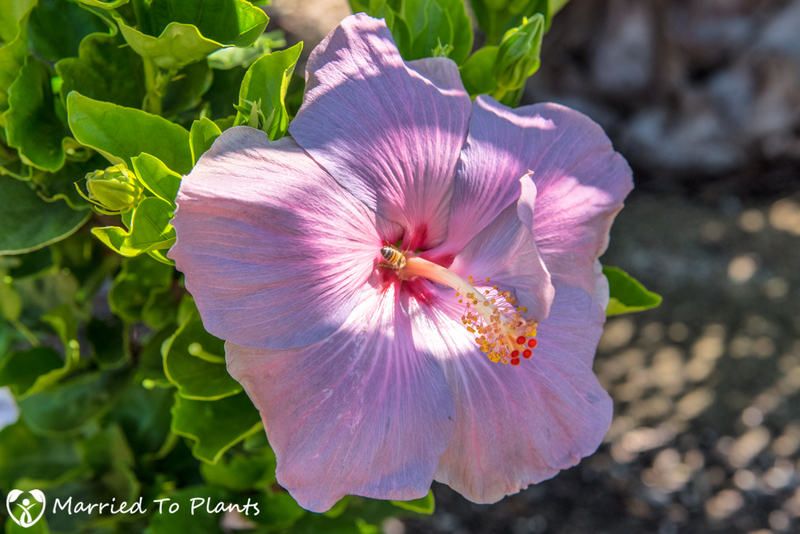 All the way from Rio de Janeiro, Brazil, Liz Ridzi Jordan is a long time hibiscus hybridizer and the owner of Hibiscos. 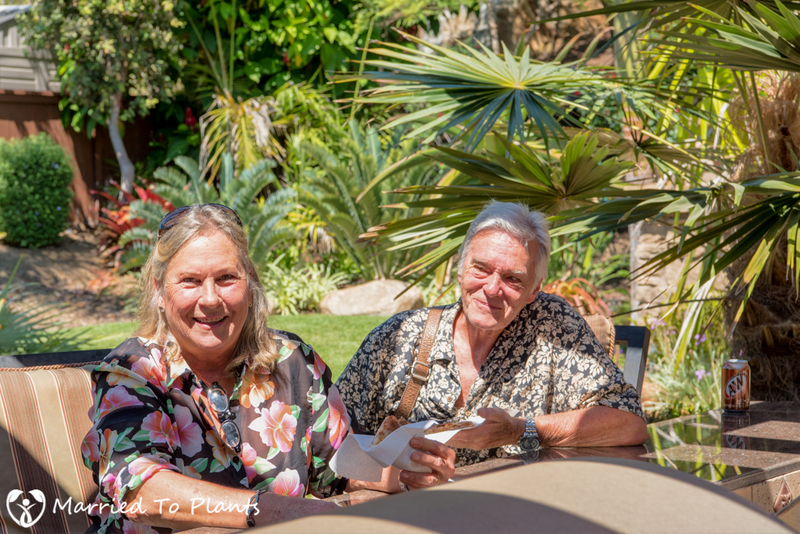 Liz happened to be in Southern California visiting her son in San Clemente during the SCHS tour at my garden. So we got lucky. Charles and Cindy Black also made an appearance. 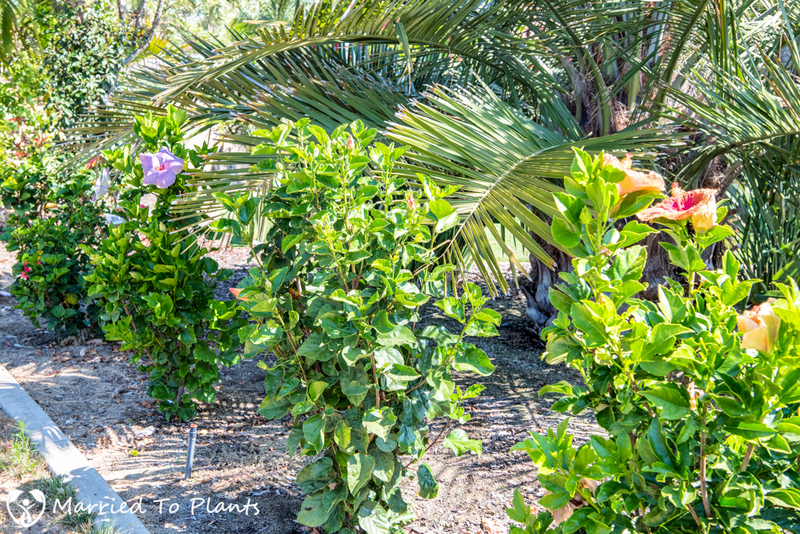 They are the owners of Hidden Valley Hibiscus. 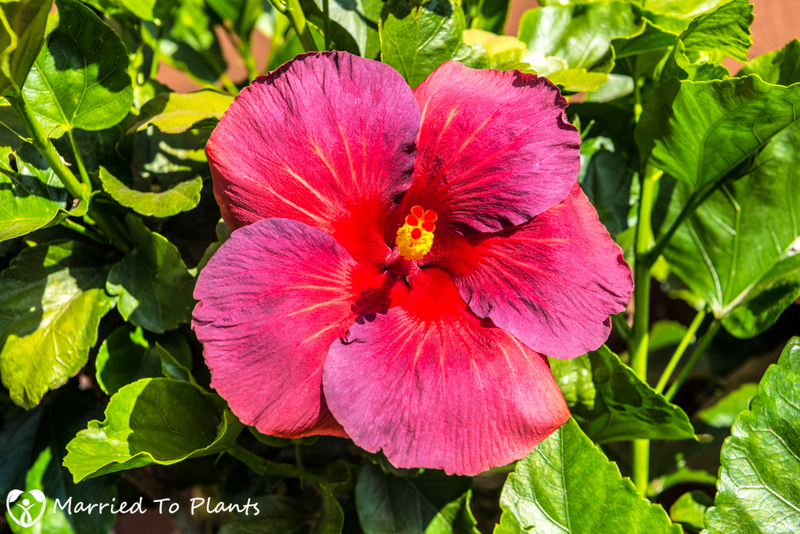 Charles has personally introduced hundreds of new cultivars to the hibiscus world with many more still in the works. 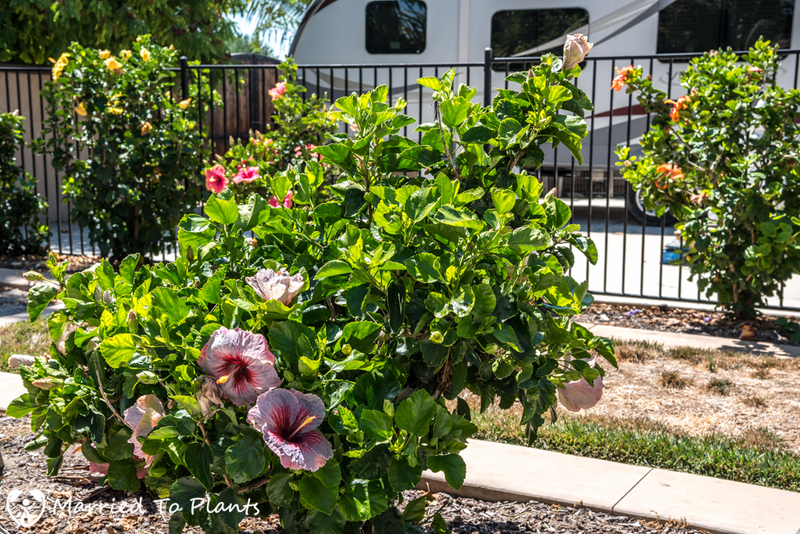 Plants from Hidden Valley Hibiscus represent about 75% of my entire hibiscus collection. 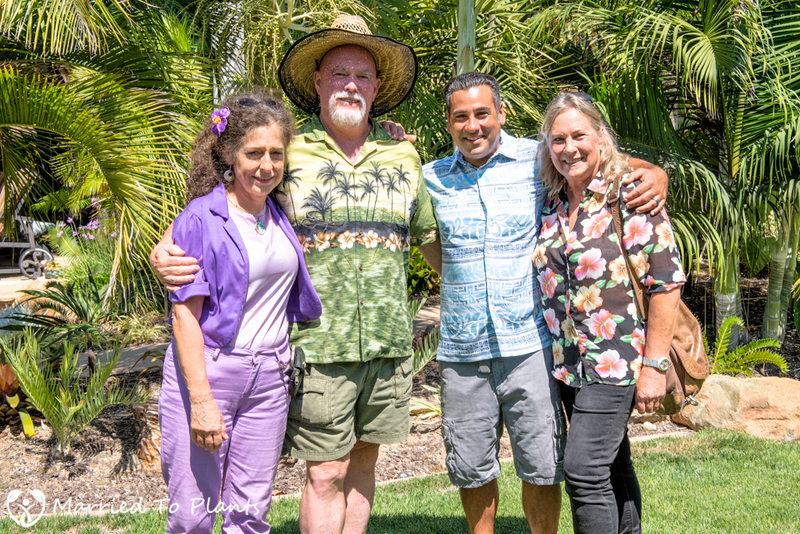 I love their plants and it was an honor to get to talk to Charles and Cindy in my garden. Here they are with the President of the SCHS, Darren Eminian, in the middle and Liz Jordan on his right. 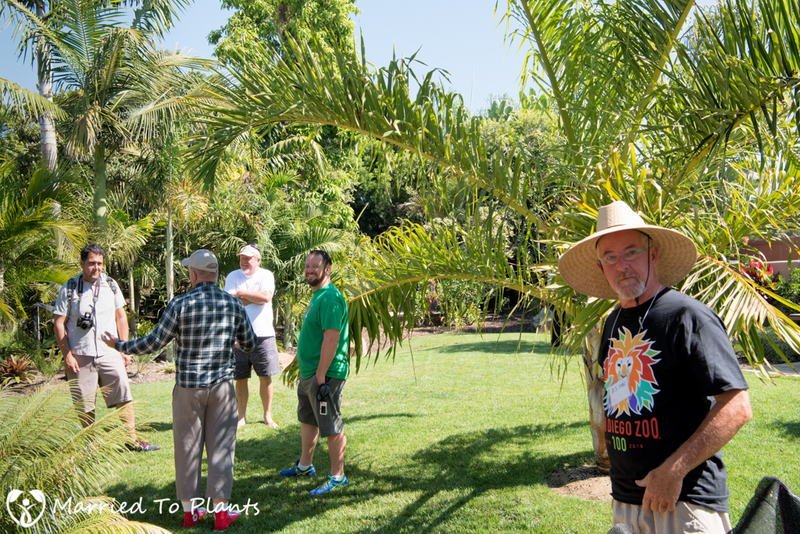 Plant people tend to wear colorful shirts when touring gardens. 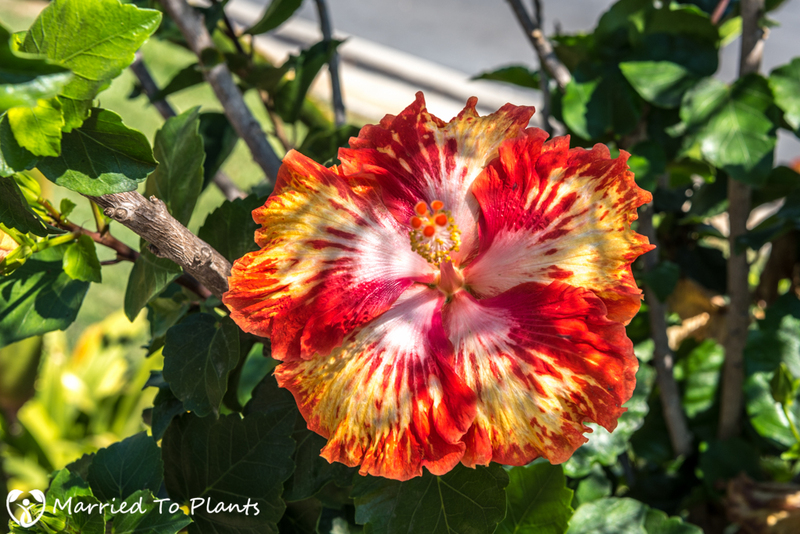 I think hibiscus lovers tend to be some of the most flashy when it comes to attire. Can’t beat these shirts. And the red Converse? Hey, I know these guys. 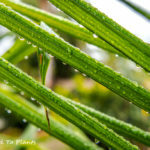 They are also members of the Southern California Palm Society. Touring attire toned down. President of the SCHS, Darren Eminian, giving his report to membership. Leading an all-volunteer plant society is really a thankless job. Darren is a great ambassador for the SCHS and hibiscus world in general. Oh, and no, the pizza didn’t last long. 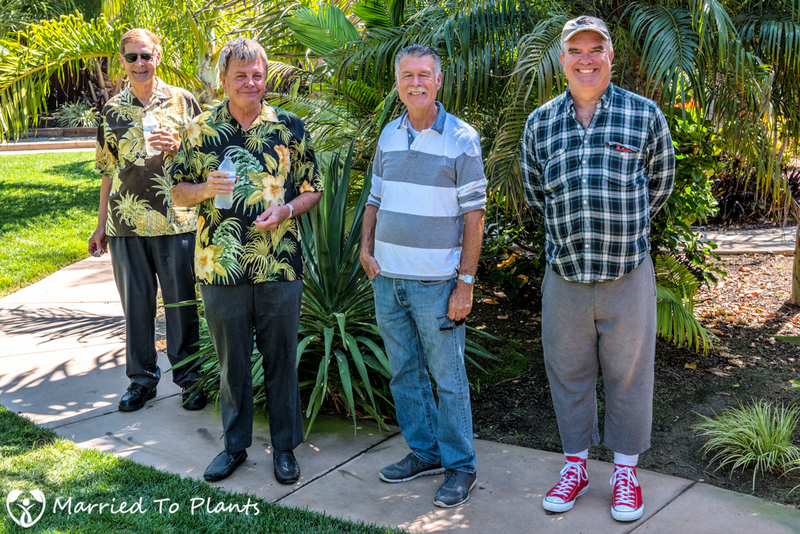 When I was asked to host the September meeting back in May, I started working hard to get my plants into tip top shape. 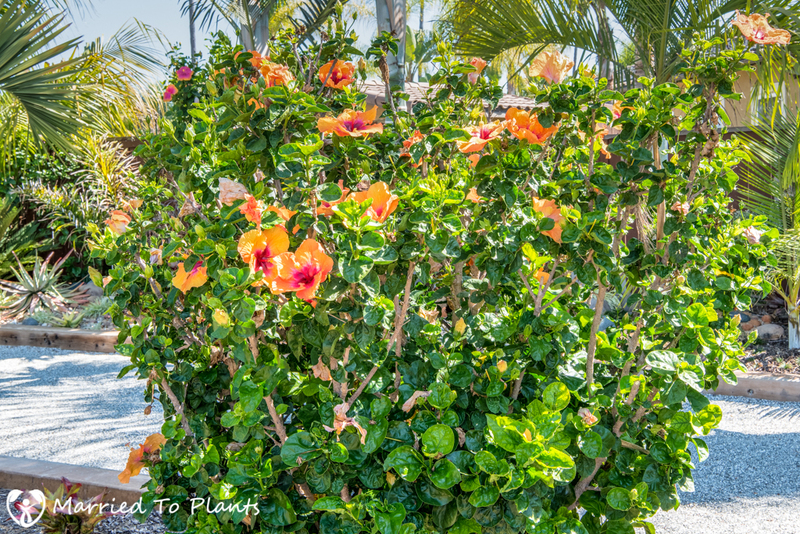 After all, some of the people coming down were real hibiscus connoisseurs. So the pressure was on. 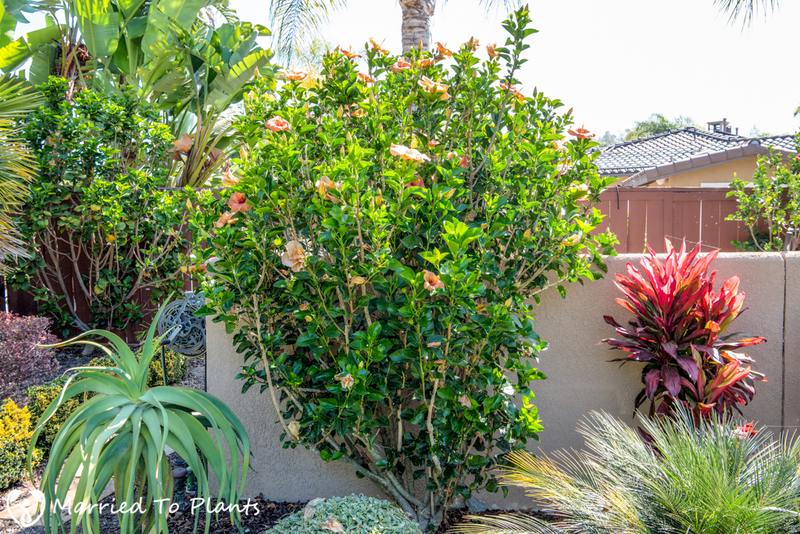 I thinned out my plants to get the best growth for new blooms. 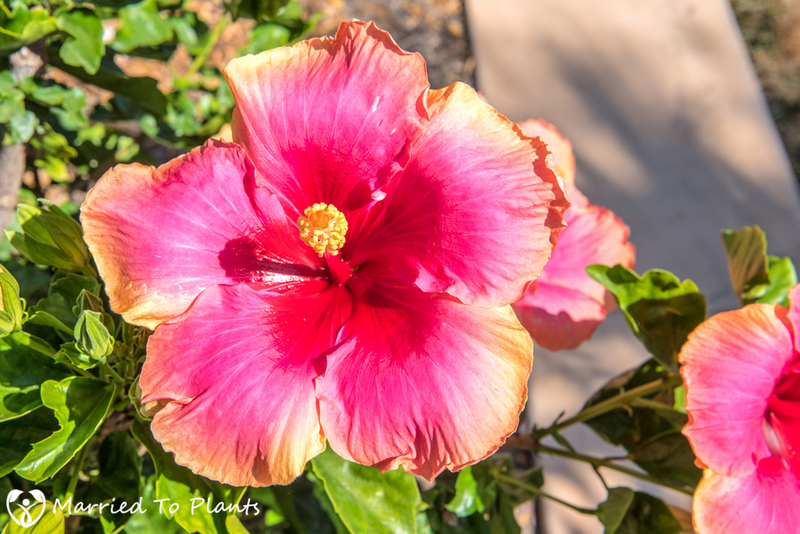 I fertilized heavily to boost the plants to get the most blooms and make sure their color was the best. 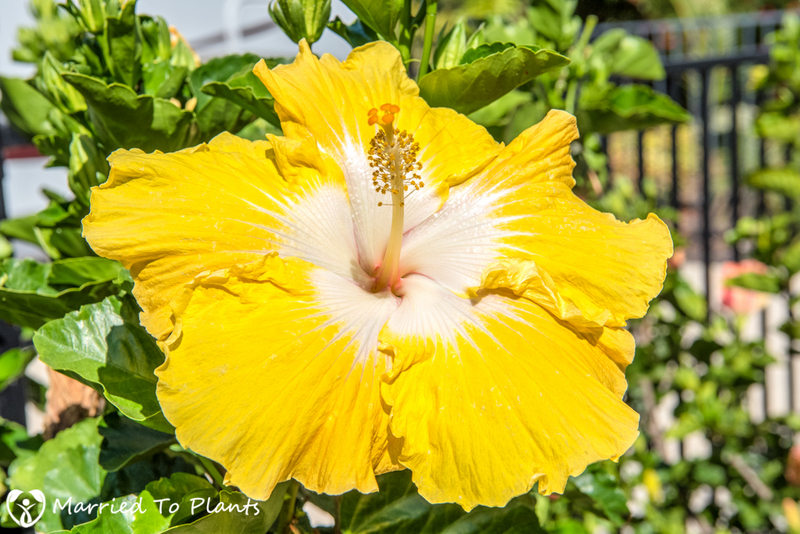 For the last two months I have had an amazing show of flowers. But as fate would have it, the day of the meeting my plants decided to play coy. I just knew this would happen. The plant gods can be cruel. The tough part is, the following day almost every plant in my garden was in flower. What the heck? 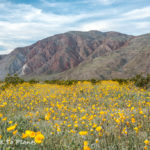 I had hoped for better, but these are the best flowers I saw during the tour to get pictures of. 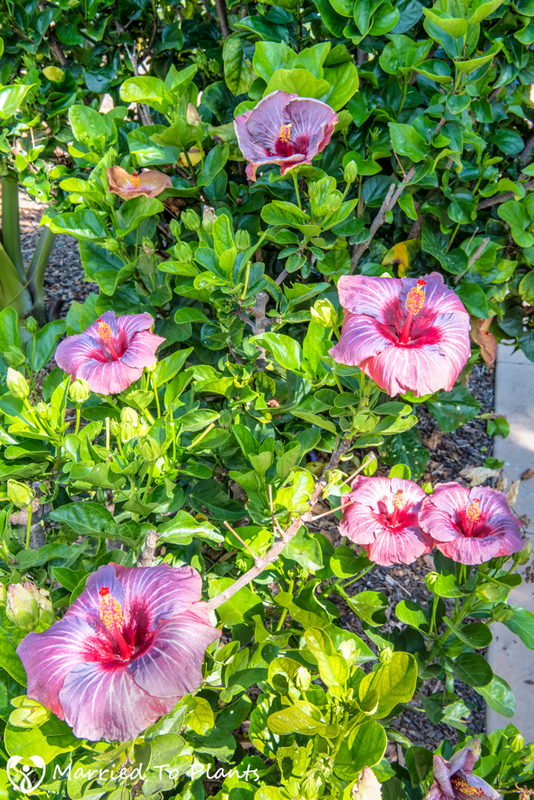 Below are my oldest hibiscus, which are planted in a row bordering my dog run. 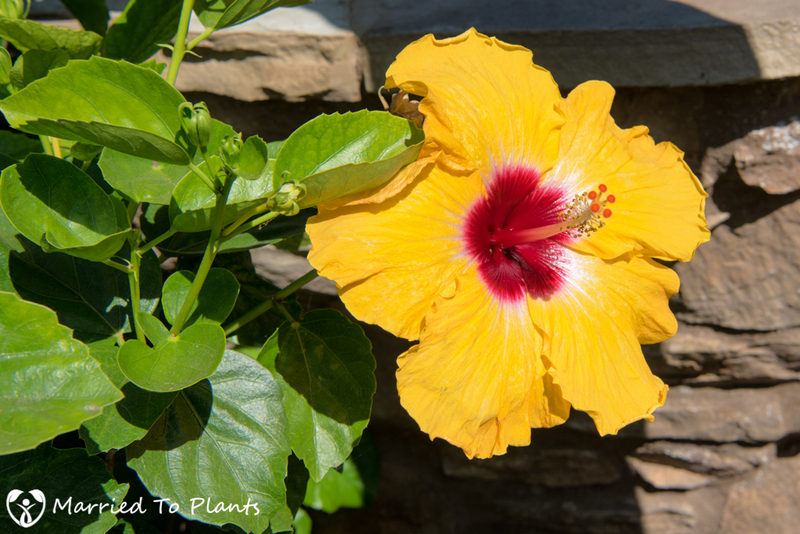 Last summer I ripped out an old boxwood hedge and replaced it with eight new hibiscus that I planted in a row to hide my neighbor’s driveway. I think my neighbor likes the change. 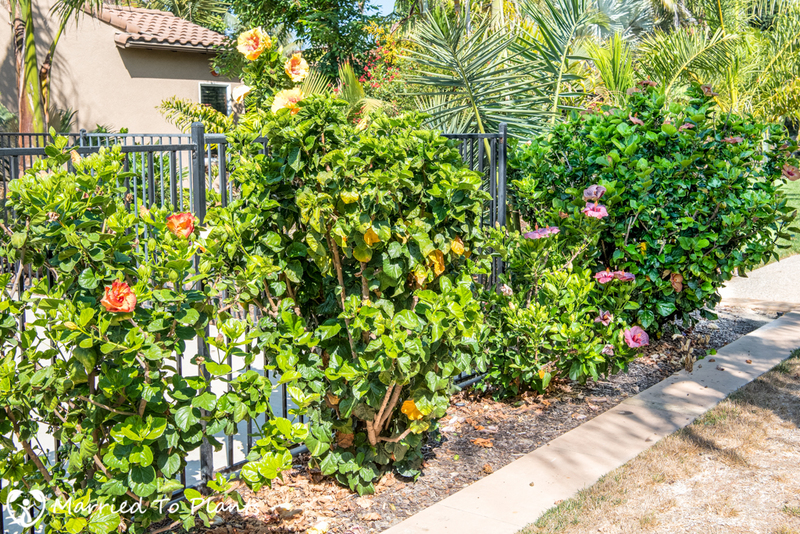 What better way to show off one of your favorite palm trees in the garden (Copernicia fallaensis, in this case) than to anchor it with two beautiful hibiscus. ‘Hot Babe’ on left and ‘Party Girl’ on right. 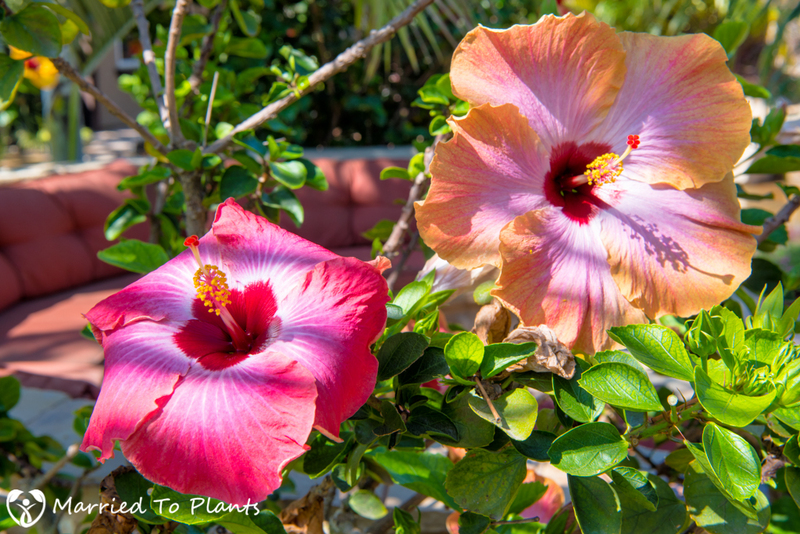 ‘Rum Runner.’ New flower on the left and the two-day-old flower on the right. 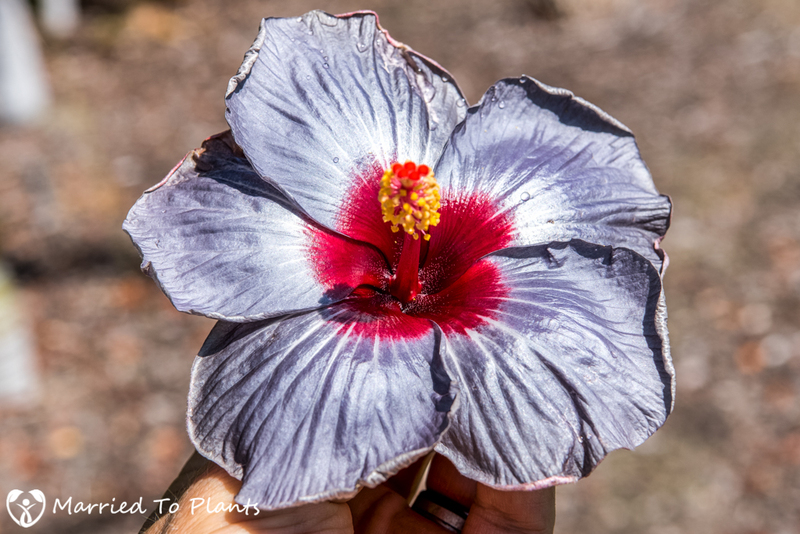 ‘Silver Lining.’ This is one of my favorite new hibiscus. 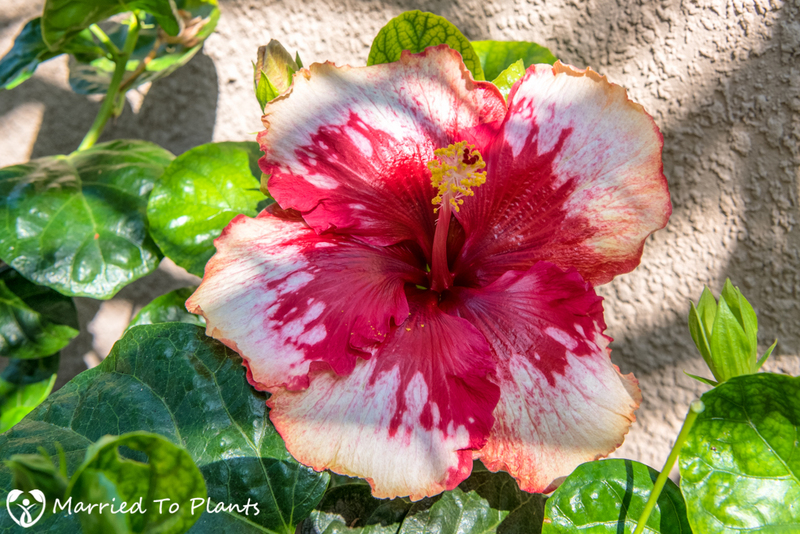 This is a Hidden Valley Hibiscus cultivar that literally has a metallic sheen to the flower. You can clearly see it in the photo below. ‘Delectable.’ Subtle coloration but it appears the honey bees like it. 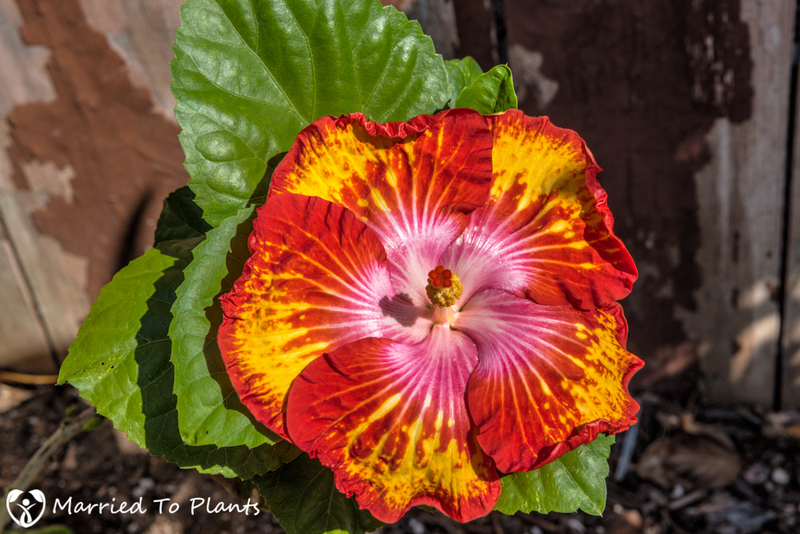 ‘Ecstatic.’ Another favorite from my newly added plants to the garden. 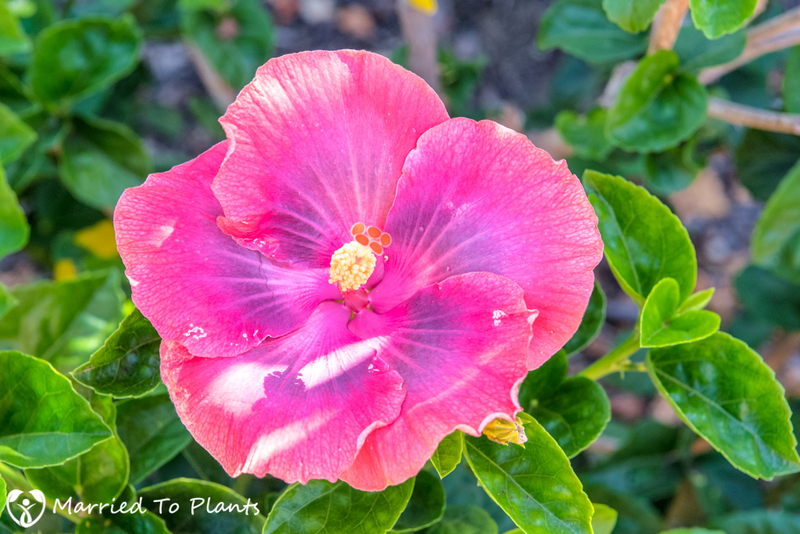 If you enjoy garden tours, even if hibiscus are not your favorite flowering plants, joining the Southern California Hibiscus Society is a great resource. 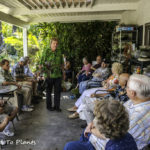 One Saturday each month from April to November, a garden is opened up in the Southern California area for SCHS members to visit. 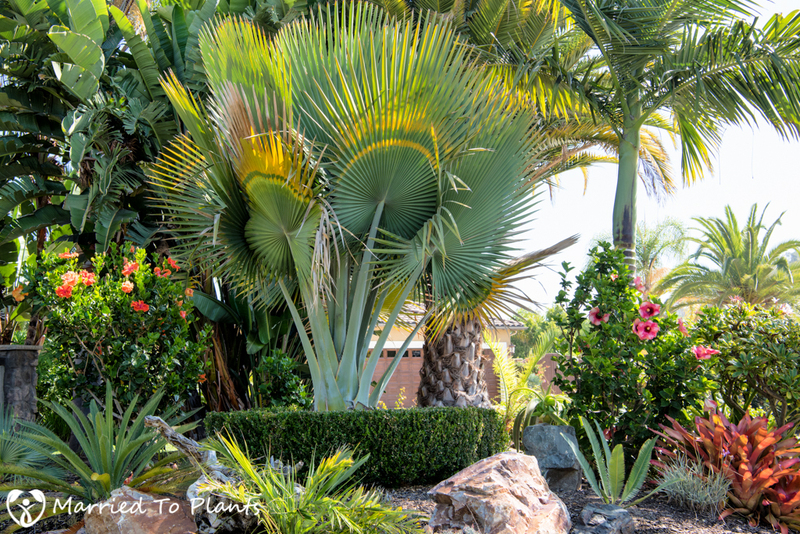 It is a great way to meet other crazy plant people like yourself and to tour some amazing private gardens from which to incorporate a few more ideas into your own masterpiece. 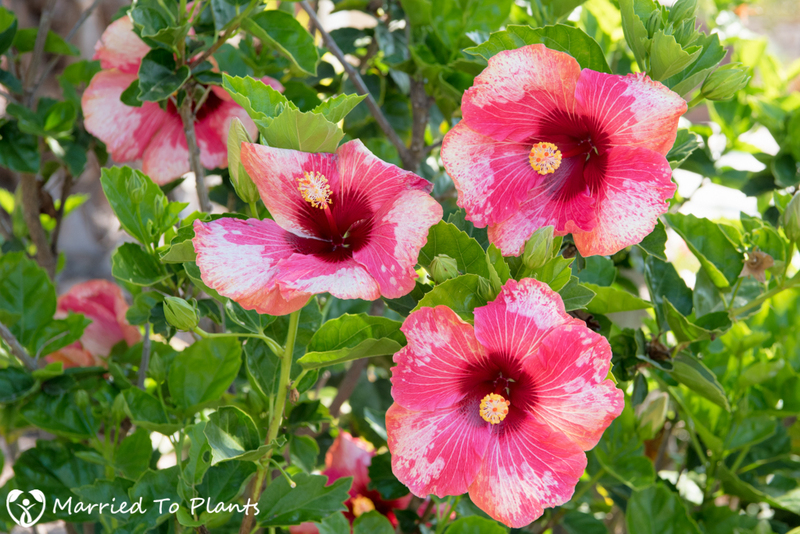 The meetings are also a great way to source some hard to find hibiscus cultivars during their auction. 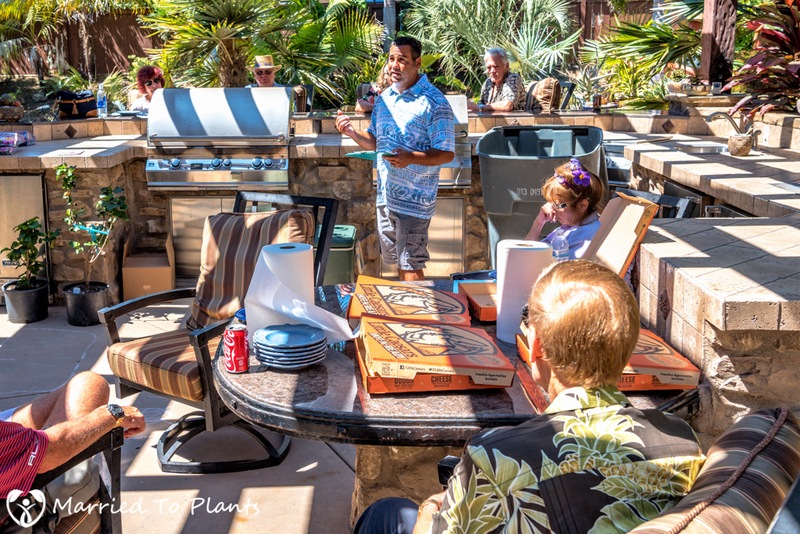 I hope to see some new people at the next meeting! 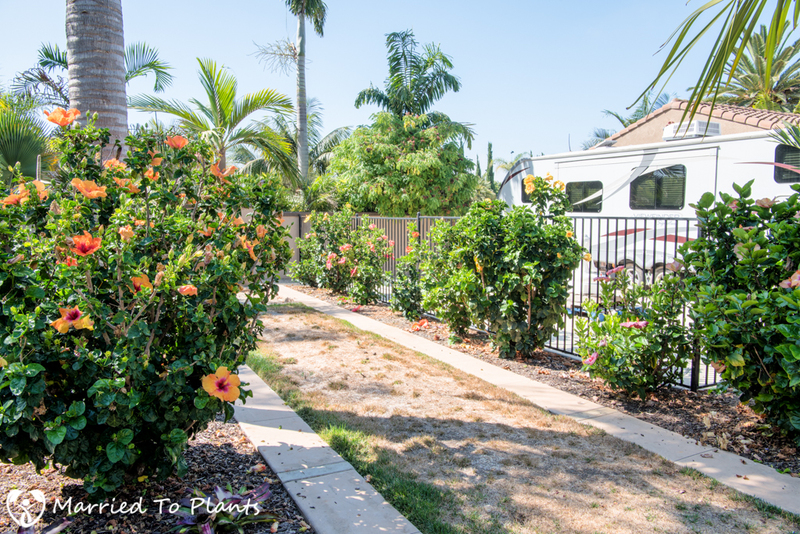 Len,in one photo of your yard I thought I saw a Plumeria pudica. 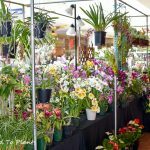 How does it compare to rubra or obtusa? Yes, it is Pudica. It really suffered in the 2007 freeze but it has grown like a champ since. I actually need to move it as it has grown too big. It looses it leaves very quickly once the temps drop.